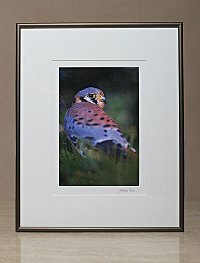 Fine art prints, box-mounted photos, and greeting cards can be ordered through our website. Just click the "Add photo to cart" link when you see an image in the Gallery you would like to purchase. When you are ready to purchase, click the cart link and follow the instructions on that page. These stunning photographs are, quite simply, the finest color photographic prints that can be made. They have unequalled sharpness, color saturation, and tonal range; and they offer the ultimate in fidelity to the scene witnessed and recorded on film by the photographer. In addition, they have exceptional archival stability that significantly exceeds the longevity of traditional color prints. Find out more about our fine art prints! A box-mounted photograph is an 8x10-inch print (a 6x8-inch cropped photographic image with a 1-inch white border around it), mounted to the front of a mica and fiberboard box, and covered with a glossy laminate finish. The 1 ½ -inch side edges of the box are finished with mica in a color that complements each photograph. A box-mounted print can be hung on a wall (each one comes with a wire on the back, and hardware for hanging); or it can be displayed on any flat surface such as a desk, counter, or bookshelf. Price: $49.95 each, plus tax and shipping. View the available box-mounted photographs. Price: $2.50 each (including envelope), plus tax and shipping. View photographs available as greeting cards. Please Note: If you are only ordering greeting cards, the required minimum purchase is 10 cards. You may select any combination of available cards for your order. Volume discounts are available for purchases of 500 cards or more. (For discounts, all cards must be the same).